See a video interview about my new book is The Posthuman Dada Guide: Tzara and Lenin Play Chess, from Princeton University Press. . I don't know about you, but I think that the 21st century cannot do without Dada; this book is not another study of Dada! it is a practical guide to the Dada life. 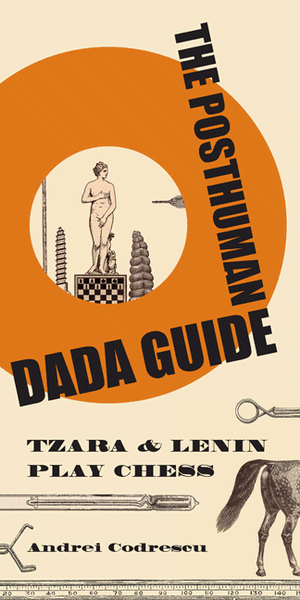 The Posthuman Dada Guide is an impractical handbook for practical living in our posthuman world—all by way of examining a 1916 chess game between Tristan Tzara, the daddy of Dada, and V. I. Lenin, the daddy of communism. This epic game at Zurich's Café de la Terrasse—a battle between radical visions of art and ideological revolution—lasted for a century and may still be going on, although communism appears dead and Dada stronger than ever. As the poet faces the future ideologue over the chessboard, neither realizes that they are playing for the world. Taking the match as metaphor for two poles of twentieth- and twenty-first-century thought, politics, and life, I’ve created my own Dadaesque guide to Dada—and to what it can teach us about surviving our ultraconnected present and future. Here dadaists Duchamp, Ball, and von Freytag-Loringhoven and communists Trotsky, Radek, and Zinoviev appear live in company with later incarnations, including William Burroughs, Allen Ginsberg, Gilles Deleuze, and Newt Gingrich. The Posthuman Dada Guide is arranged alphabetically for quick reference and (some) nostalgia for order, with entries such as "eros (women)," "internet(s)," and "war." Throughout, it is written in the belief "that posthumans lining the road to the future (which looks as if it exists, after all, even though Dada is against it) need the solace offered by the primal raw energy of Dada and its inhuman sources."